Ergonomic acrobat. This tablet can literally be hung up on a nail. The most striking feature of the new, affordable Yoga scion is undoubtedly its flexible stand that proved extremely handy in the test, although it also increases the weight. Our report will, of course, closely examine the technical aspects, screen, connectivity, and battery life. For sheer value for money, yes. The Lenovo Yoga Tablet 2 isn’t exactly a budget tablet, but it’s well capable of competing with models that are a great deal more expensive. If you can’t afford to shell out over £300, it’s an excellent choice. Key features, including battery life and performance, are up there with the best, while speaker quality is also very impressive. Furthermore, its unique design and iconic stand give it an edge over anything currently out there. One of the best parts of the Lenovo Yoga Tablet 2 is definitely the four modes of use, where I found it really great to have the stand on the back where I could hold it or position it in very specific ways. Having the hole in the stand is genius on Lenovo's behalf, as people who use the tablet in their kitchen or garage are going to have one of the best uses for that stand. The rear-facing camera was actually surprising, something that I didn't expect from the Yoga Tablet 2. Not that you'd buy this tablet for the camera abilities, but it's a nice addition to the slate. The video quality was also surprising, which is another credit to Lenovo. Lenovo’s YOGA Tablet 2 family offers some new features and versatility we haven’t seen on other tablets. While the YOGA Tablet 2 Pro is sure to attract attention with its huge 13.3-inch display and built-in pico projector, the 10-inch YOGA Tablet 2 may be more practical for some users due to its more portable footprint and much more affordable price tag. The Yoga 2 is a fun and powerful tablet that provides a great deal of versatility. For a 10-inch Android tab that's under 300 bucks, you can easily do much worse than the Yoga 2. With its powerful battery life, front facing speakers and useful stand options, this Yoga is a fine media device for videos and mobile games. We wish Lenovo could have added some protection for the display from scratches. Even the metal kickstand attracted scratches in the short term of use. The device is after all meant as a mobile entertainment device, and to be moved at different locations easily, it’s so evident that users will tend to use it a bit rough. Apart from that, the Yoga Tablet 2 10-inch costs of about 1100 AED. With the solid kickstand, and different modes of operation, a fast processor and a very good display, we think the device is really worth it. Lenovo’s latest take on an Android tablet is indeed an interesting one, and the efforts made in this second generation product are far, far more usable than what we saw turned out from the company last year. We’re still not sure about the design from a weight point of view, that said, but certainly for the desk, for typing, and for using the tablet in places you’ve never really thought about, the Yoga Tablet 2 is an intriguing proposition worth checking out. The Yoga Tablet 2 delivers what we've come to expect from Lenovo's Android tablets: good design and an awful Android overlay. I'm not a fan of the simple skin Lenovo tends to tack onto its tablets, but on the other hand, the bare-bones interface is appealing to new users. However, anyone who knows their way around Android will be disappointed by its stripped-down features. Picking an affordable, large-screen Android tablet is all about compromise. You just can't expect to find the best performance, thoughtful software, and attractive design in a sub-$300 device. The Lenovo Yoga Tablet 2 comes close, though, delivering unique looks, a sharp full HD display, and good-enough performance for most needs. It also achieves all of this without demanding a huge premium over the competition. The Lenovo Yoga Tablet 2 10 is a big improvement on the first Yoga Tablet, thanks to its high-resolution screen and improved processor. At 13h 20m in our continuous video playback test, battery life was also very good. The kickstand adds weight but is very useful in the home. It's a shame the screen's colour accuracy is below average, but this is still a competent and versatile tablet. The Lenovo Yoga Tablet has a useful kickstand and great hardware, but there are a couple of ergonomic issues that outweigh the benefits. For starters, the cameras are placed at odd positions which make them so awkward to use, you’d rather not use them at all. Secondly, at 619 grams, it’s at least 200 grams heavier than other large-screen tablets in the market. This makes it difficult to carry around or use for long hours. The Yoga Tablet 2 is the kind of Android tablet that grows on you over time. The kickstand comes in so handy, I found myself using this device more than competing slates, whether I was watching videos or checking sports scores in Stand mode or typing a quick email reply in Tilt mode. The Yoga Tablet 2's more than 12 hours of battery life is another big selling point, especially since it costs just $269. Here we are a year later -- and sadly, it's the same exact story: This year's Yoga Tablet 2 and Yoga Tablet 2 Pro are cool concepts that come up short. Despite their clever forms and commendable stamina, they suffer from underwhelming displays, subpar performance and one of the oddest and most confusing user interfaces I've ever encountered. No matter how much I want to like them, their deficiencies are just too foundational and the resulting user experience too poor to be forgiven. For thirty quid more than the Yoga 1 the Yoga 2 fixes all the shortcomings of the original machine. The display is wholly superior, the chipset more powerful, the camera much better in all ways, the cellular modem gets 4G capability and by drilling a hole in the stand a whole new range of positions have been created. With a price tag of around 28K, the Lenovo Yoga 2 gets ample competition from the iPad Retina or the Samsung Tab 4 or the upcoming Nexus 9. Nonetheless, the Lenovo Yoga 2 tablet is a good buy and from a practical perspective better than the rest but it lacks the utter simplicity of the Android UI since it is highly customized. 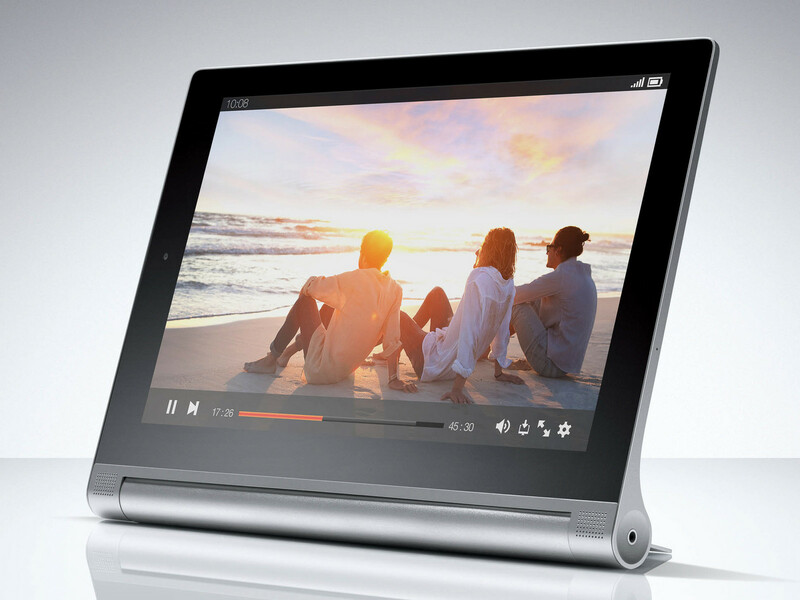 So has Lenovo's second stab at the Yoga Tablet proved a success? Well, Almost. Whilst we commend the company for delivering on its promise of all-day battery life, creating one of the most ergonomic tablet designs out there and giving users a great entertainment option, these skills alone won't be enough to win the masses over. 80% Flexibles Netbook oder teures Tablet? Positive: Excellent performance; good display; decent sound quality; good autonomy; reasonable price. Positive: Excellent build; comfortable leg-stand; high performance runtimes; windows ecosystem; built-in modem. Negative: No full USB-ports; high price; limited performance for gaming. The new generation Yoga Tablet 2 is uniquely designed to be practical and adaptable. The most prominent feature is a built in kickstand that has a sizeable hole in the middle, allowing the device to be hung from hooks or nails on the wall. The stand also allows the Yoga 2 to be propped up vertically or angled parallel to a surface. It comes with an Accutype keyboard dock, which also functions as a cover. The screen is 10.1 inch with a ratio of 16:10 and resolution of 1920 x 1200 pixels. It is 10 point touch sensitive and has wide viewing angles thanks to IPS technolgy. The Yoga 2 weighs about 600 grams, which is considered moderately acceptable for a tablet of this size. At the heart of this device is a quad core Intel Atom Z3745 processor with a clocking speed of 1.33 GHz, which can overclock up to 1.86 GHz in turbo mode. Other hardware on this device include 2 GB LDDDR3 RAM and 16 GB storage. Storage is easily expanded with the presence of a micro-SD slot that supports cards up to 64 GB. This tablet however, has been portrayed as difficult to hold due to its bulkiness, but this fault is easily forgotten as it has excellent entertainment capabilities. This is because there are equipped with Dolby Audio and Wolfson Master Hi-Fi codec. There are also front and rear cameras which are 1.6 MP and 8 MP respectively. The Thinkpad Yoga is a series of ultrabooks manufactured by Lenovo. The Yoga Series was launched during 2012, and its successor, the ThinkPad Yoga 2, was released in the 4th quarter of 2014. The Yoga laptops are made to be as light, thin and portable as possible, targeting the young and tech savvy consumers. The Thinkpad Yoga stands out due to its unique feature of being able to fold flexibly up to 360 degrees to switch to tablet mode. The Yoga Series started out in the end of 2012, with the Yoga 11 and Yoga 13 models, which are 11 and 13 inch respectively. Yoga 2 Pro was the second generation to be released end of 2013, a 13.3 inch model that is significantly lighter than the Yoga 13. The latest model to be released in the series is the Yoga 3 Pro, released recently at the end of 2014. This new model is even thinner and lighter than all its predecessors while maintaining the 13.3 inch size, although due to a more powerful processor the battery life is slightly reduced to just under 6 hours. Besides the ThinkPad Yogas, there are also the IdeaPad Yoga Tablets, which come in 8 inch and 10 inch size as well.